This is the seat cover for (Honda 2015 2016 CRV).Are you tired of stuff clinging to your car seat? Are you tired of dirty,breakdown of your car seat? Kust is proud to offer OEM-look solution to your problem.Our high quality custom fit leather seat cover is made of green artificial leather and sewn with impeccable craftsmanship. The leather seat cover fits like the glove and is held in place by high-strength elastic bands. Installation is very easy with instructive video on YouTube(Kust). Just tighten paste the cover’s belt over the back by the bracket accessories from the instructive video. All seat cover functionality is preserved and its looks and ergonomics are greatly enhanced by our leather cover. Buy with confidence as Kust products are known for their high quality, craftsmanship. Please Check Your Car to Avoid Buying Wrong Product Not For Fitment Chart, Make Sure It Fit For Your Vehicle. 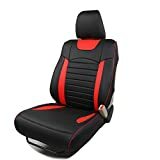 Quality Selected Environmental Artificial Leather Material Black-red Sewed Hand-worked Designed to Care Your Car Seats More Meticulously. 100% Brand New,4 pcs Saddle Cover,4 pcs Back Cover,5 pcs Headrest Cover in Our Package Transported To You.Why Not Purchase One To Light Your Decorative Car? Our OE-quality Car Seat custom fit Cover will give your car more outstanding customed appearance and satisfaction. Top level customer service,and our customer service specialists are always standing by to solve any of your problem. Please check your car to avoid to buy wrong product, and if you need help, just contact us.